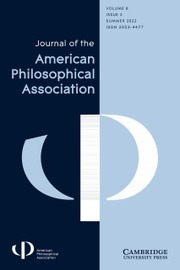 Appearing quarterly in print and online, the Journal of the American Philosophical Association provides a platform for original work in all areas of philosophy. The Journal aims to publish compelling papers written in a way that can be appreciated by philosophers of every persuasion and to review papers quickly (typically within 30 days of submission) and fairly (using a triple anonymous review system), encouraging succinct, constructive reports. Papers are published online early via FirstView (typically within 8 weeks of acceptance). Instructions for contributors and a statement on the Journal's open access policies, which comply fully with all mandates issued to date, can be found here. Read the full Editorial Statement here. The Journal is a member of the Committee on Publication Ethics (COPE).